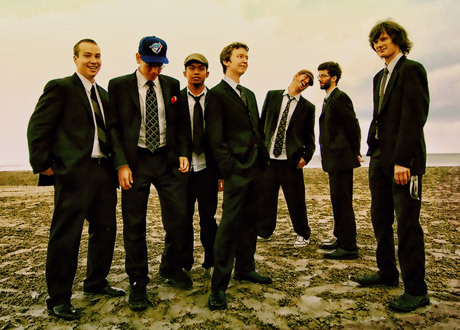 Toronto, ON-based septet KC Roberts and the Live Revolution throw down some wickedly contagious grooves on their debut offering, Parkdale Funk 1. They charge right onto the dance floor with the electric one-two punch of "Far Away" and "The Pillage of Bloor West Village," two vibrant slices of up-tempo, acid-jazz-tinged funk fuelled by truly smoking J.B.'s- and Tower of Power-inspired horn charts, some sick guitar soloing and colourful keyboard touches, with Roberts' clean vocals on top, often recalling the effortless cool of the Average White Band's Alan Gorrie. The band dig even deeper into the funk with the seriously on point attack of "Too Late," the best track of the set. There are smatterings of Afrobeat, drum & bass, hip-hop and folk influences throughout, and although it's not an entirely seamless blend, everything gels on "The Road To Dar Es Salaam," a ten-minute-plus drum & bass meets Afrobeat excursion that builds from a minimalist trance-like groove into a fully fleshed out piece of intoxicating exotica. If one needed proof of the vitality and authenticity of new Canadian funk music, they need look no further than Parkdale Funk 1. You've developed quite a following with your live shows. How much of the energy and vibe of your shows have you tried to capture on the album? Lead vocalist and guitarist KC Roberts: The approach that I was taking was that I wanted to write songs that sound good with these musicians. I wanted to capture the whole energy of the band. Even in the mastering process, we had to pull it back a bit because we wanted the live feel. I wanted to hear the way my drummer hits that snare differently every time. I think a lot of the tracks on the album capture that more than others, like "The Road To Dar Es Salaam," in which the saxophone solo was dropped in one take. That was pretty magic. Could you tell me what the inspiration was behind that song? I went to Kenya and it was my first time outside North America ― huge culture shock. We got on this bus and started driving from Mombasa, Kenya to Dar Es Salaam in Tanzania. It was a 12-hour ride and most of it was on this dirt road; it was the roughest road and impossible to sleep. I think I was sitting there feeling so far away from home. The song itself represents the entire journey.